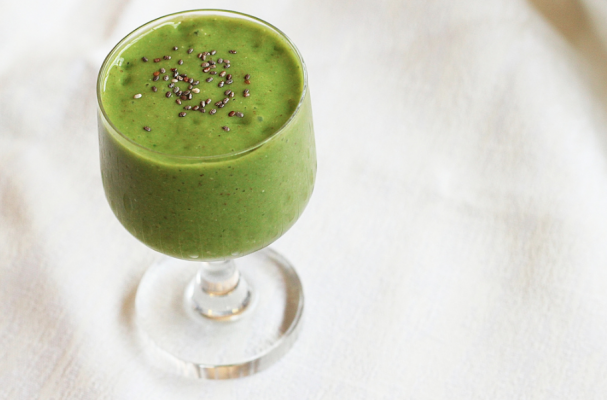 If you have been avoiding McDonald's Shamrock Shake for fear of breaking your new diet, this green smoothie is festive and healthy. A green smoothie can be deceiving because while it is packed with tons of vitamins and nutrients, some recipes call for fruit juice which also contains a lot of sugar. This particular smoothie is made by blending two frozen bananas, fresh kale, fresh avocado, almond milk, ice, dates, almond butter, hemp seeds, chia seeds and spirulina (optional) together until smooth. The finished product is a thick emerald-hued drink that will get you pumped to start your day. Step 1: Add bananas, kale, avocado and almond milk to a blender pitcher and blend until almost smooth. Add ice, almond butter, dates, chia seeds, hemp seeds, and spirulina (if using) and blend again until all the ingredients have combined into one cohesive mixture. Step 2: Serve immediately in a tall glass.